I came across this newspaper clipping in a used bookstore. It was tucked inside a book with a publishing date of 1921. I was immediately enamored with this tangible slice of history, and placed the words delicately in my hands. Treasure! 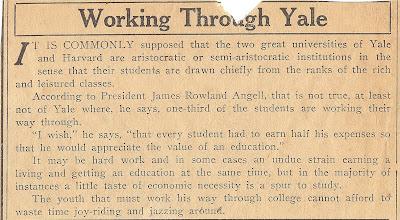 It describes some general assumptions about students at Ivy League schools coming from the "rich and leisured" classes. The president of Yale refutes this assumption, stating that 1/3 of their students are working their way through school. " 'I wish', he says, 'that every student had to earn half his expenses so that he would appreciate the value of an education.'... The youth that must work his way through college cannot afford to waste time joy-riding and jazzing around." I hope today's parents keep these principles in mind when the time comes to send kids to college. And I hope they use the specific language "joy-riding and jazzing around" to demonstrate their point. I love love love finding newspaper clippings in old books. There are a lot! Usually they're not this good though! This is so awesome. I think I STILL do too much jazzing around. I would have been excited to find this clipping, it's always cool to find something forgotten in unexpected places. Wow, I had no idea it was that old of a clipping. I thought it was fairly recent. But when you mentioned that you DISCOVERED IT!... that's awesome! I love stuff like that. I completely agree that working through college keeps you connected to the realities of the world outside the school walls.